Who should not take Perjeta Vial? 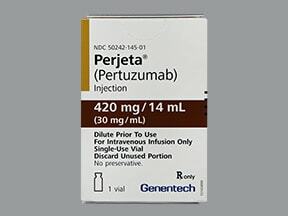 Pertuzumab is used with other medications to treat certain types of breast cancer that has spread to other parts of the body in patients who have not received treatment or chemotherapy. It is also used with other medications to treat early stage breast cancer in patients who will be having surgery to remove the cancer. The types of cancers pertuzumab is used to treat are tumors that produce more than the normal amount of a certain substance called HER2 protein. A health care professional should watch you for at least 60 minutes after your first infusion is finished to make sure you do not have an infusion reaction (see also Side Effects section). What conditions does Perjeta Vial treat? Tell your doctor right away if you have any serious side effects, including: swelling ankles/feet, trouble breathing, unusual tiredness, numbness/tingling of arms/legs. List Perjeta Vial side effects by likelihood and severity. Before using this medication, tell your doctor or pharmacist your medical history, especially of: previous cancer treatments (including radiation therapy to the chest), heart disease, high blood pressure, previous severe reaction to monoclonal antibody treatment. What should I know regarding pregnancy, nursing and administering Perjeta Vial to children or the elderly? Does Perjeta Vial interact with other medications? Are you taking Perjeta Vial? Are you considering switching to Perjeta Vial? How long have you been taking Perjeta Vial?